In a slideshow at Psychiatric Times, Chris Aiken describes seven ways to improve lithium’s tolerability. Since many researchers, including BNN Editor-in-Chief Robert M. Post, have suggested that lithium should be used more often as a treatment for bipolar disorder, ways of making its side effects more manageable are of great interest. Here we summarize Dr. Aiken’s seven points and add a few perspectives of our own. Aiken writes that “when it comes to the side effects that matter most to patients—sedation, weight gain, and cognition—lithium’s tolerability ranks right behind lamotrigine.” In fact, lithium plus lamotrigine is an excellent combination, as lithium excels at preventing manias while lamotrigine excels at depression prevention. Post’s philosophy is that many of lithium’s side effects can be avoided in the first place through judicious dose titration. He suggests gradually increasing dosage, and stopping before side effects become difficult, or reducing a dosage that has already become a problem. The idea is to avoid lithium side effects even if blood levels of lithium remain below clinically therapeutic levels. Post suggests using lithium at whatever dose is not associated with side effects. Many of lithium’s positive therapeutic effects emerge at low doses, and if this improvement is insufficient, the rest of the needed efficacy can be achieved by adding other medications. As noted above, lamotrigine is a good option for break-through depression, as is lurasidone. For breakthrough mania, the mood stabilizers valproate and carbamazepine or an atypical antipsychotic can be added to lithium. A little-appreciated option for enhancing lithium’s mood stabilizing effects is nimodipine, a dihydropyridine calcium blocker. It has both antimanic and antidepressant efficacy without lithium’s side effects. Research showed that a year on the combination of lithium and nimodipine was more effective than a year of either drug alone. If a patient taking lithium experiences a tremor at a dose that is not fully effective, nimodipine can be added in order to lower the lithium dose enough to eliminate the tremor. Nimodipine specifically blocks the calcium influx gene CACNA1C that has been repeatedly been associated with the vulnerability to bipolar disorder and depression. 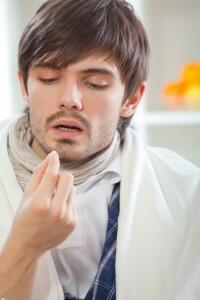 If side effects do occur on lithium, they can often be managed. The following suggestions are adapted from Aiken’s article with input from Post.Tremor responds to beta blockers and high dose vitamin B6 (900-1200mg/day), which may also improve restless legs resulting from atypical antipsychotics. Gastrointestinal side effects of lithium can also be treated. Taking lithium with food or using extended-release preparations can improve nausea. Immediate release preparations are better for diarrhea. Lopiramide (Imodium), milk of magnesia, or nimodipine (which tends to be constipating) may also improve diarrhea. While weight gain on lithium is usually minimal (a few pounds in the first year), problems with overweight can be treated with topiramate, zonisamide, or the combination of bupropion and naltrexone. Erectile dysfunction is occasionally attributed to lithium, and a controlled trial suggested that aspirin can help. As in other cases of erectile dysfunction, sildenafil (Viagra), tadalafil (Cialis), and vardenafil (Levitra) can also be used. Decreased renal function can be lessened with use of lower doses and once daily (nighttime) dosing. Amiloride can decrease the increased urine volume that comes with lithium-induced diabetes insipidus (based on lithium’s blockade of the actions of vasopressin or antidiuretic hormone.) Amiloride may also decrease fibrotic changes in the kidney. For patients who respond well to lithium but eventually must discontinue its use due to renal side effects, substituting nimodipine is likely to be an effective alternative. Researcher Steven L. Dubovsky has reported that lithium responsiveness is a predictor of response to calcium channel blockers. Thyroid disorders are a typical side effect of lithium. Out-right hypothyroidism can be treated with thyroid hormone replacement consisting of either T4 (Synthroid) or T3 (Cytomel). Thyroid stimulating hormone (TSH) from the pituitary tends to increase on lithium, as if it were trying harder to keep the thyroid secreting enough thyroid hormone. Even in the absence of low hormone levels, high levels of TSH should be treated with T4 (Synthroid), and keeping TSH levels below 2.4 may prevent relapse into a depression. Lithium does not induce anti-thyroid antibodies (as in Hashimoto’s disease), but may exacerbate thyroid abnormalities in those who already have them. Some dermatological symptoms can occur on lithium. One is acne, which can be treated with minocycline (100mg/twice per day). Another is psoriasis, which is sometimes considered a contraindication for using lithium, but can be treated with omega-3-fatty acids (4–6 gm/day). At least one study found that psoriasis in people taking lithium improved when the patients took the nutritional supplement inositol (6 gm/day).